By the three pAsurams, ‘arththam aRRadhirE’ (thirumanthra arththam (meaning) has been explained). In the third pAsuram – talked about enjoyableness (of emperumAn, enjoying His divine form). Then, it is a matter of finding companions for enjoying Him, together. In that, since nithyasUris are far off, and samsAris are people indulged in worldly matters, neither of them would be of companionship. So, it is the inevitable mind of his is the one that would be a companion. So, Oh mind! Let us enjoy this together, says AzhvAr. Please set to enjoy through thirumanthram that enlightens His true nature (manthiraththai manthiraththAl), about the glory of His having distinguished divine form/body talked about in the previous pAsuram, the One who is the source of creation of the world (kAraNathvam) – please see about doing that, says AzhvAr (to his mind). If he is enjoying based on thirumanthram (whose main word is ‘nArAyaNa’) , isn’t the meaning of this (word ‘nArAyaNa’) mainly about his lordship over the two world realms, and about His nature of having qualities? (How come AzhvAr is using this word/thirumanthram to enjoy Him as being the source of creation of the world?). That thirumanthram (word nArAyaNa), due to many authoritative references (on the word nArAyaNa), is about Him being the source of creation of the world. by these and other references, His creating the world shall be said by the word nArAyaNan. So, Oh mind! Let us enjoy the janakan (creator of births). mada nenjamE – Oh mind which is amicable (to me)! enRum vAzhalAm – you can get good life always (in paramapadham). indhirarkkum piramarkkum mudhalvan thannai – In ‘mU uruvum kaNda pOdhu onRAm sOdhi [thirunedunthANdakam – 2]’, it was by squeezing the words we get the true meaning; AzhvAr is showing that it is what the meaning he means, by showing it explicitly here. You see, AzhvAr is saying ‘that is what I said earlier that He is the only one who is the lord!’. Creator of indhra who is accepted by all as a jeevAthmA, and for brahmA who could be misunderstood as eeSvaran (controller). While it would have been appropriate to talk first about brahmA who could be doubted as eeSvaran, why say indhra first – it is to show that like indhra, brahmA is also one included in all that are created by emperumAn. But, rudhran also could be doubted as eeSvaran. Why has AzhvAr not mentioned about him? 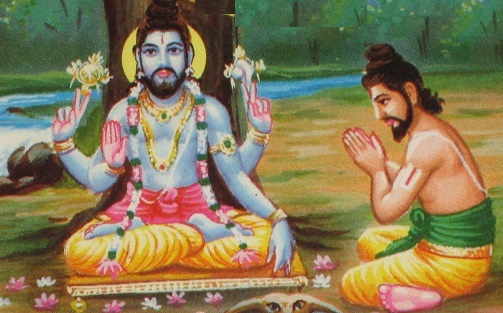 As said in ‘brahmaNaSchApi sambhUtha: Siva ithyavadhAryathAm [mahAbhAratham – anuSAsana]’ (emperumAn talking to garudAzhvAr: Can say about four types of creation in another way too – hiraNya garbha that is said as lotus is first creation; brahmA who was created from it is the second creation; Siva was created from brahmA – conclude this in your mind; this was the third creation; from him skandha was created; this was fourth creation), and in other such references, it is famous that he is the son of brahmA, and so when having said about the main of all, that is brahmA and the ending dhEva of all that is indhra, by prathyAhara nyAyam (when first and last letters of alphabet are mentioned together, it includes the ones in between as well), it is to be concluded that rudhra is also included amidst this list. (emperumAn first created Sabdha thanmAthrai – (thanmAthrai -> like the stage between milk and curd, where it is neither milk nor curd); from Sabdha thanmAthrai, AkASam (space) is created. Then from it, sparSa thanmAthrai is created (stage in-between AkASa and vAyu); from that vAyu (air) is created; then rUpa thanmAthrai is created (state in-between vAyu and thEjas); then from it thEjas is created; from it rasa thanmAthrai; from it water; from it gandha thanmAthrai; from that pruthvi (earth); So each creation includes cumulative qualities of earlier stages of creation; for example, pruthvi includes all the qualities of Sabdha, sparSa, rUpa, rasa, and gandha; this is also explained in ‘pUnilAya aindhumAy [thiruchchandha viruththam – 1]’. Reason for saying vyashti srushti (which is a latter creation) first and then samasthi srushti (which is a prior creation) in this pAsuram is – since it is with brahmA et al where there may be doubt whether they are eeSvaran; there is no such doubt in core elements. While it would be valid to say samskrutham and then thamizh which is its changed/derived form, instead, he enumerated thamizh first because – it is eligible to be perused by everyone, being very good at conveying clear meaning, and it is his area of language usage, and also like samskrutha vEdham, thamizh vEdham (dhivya prabandhams) is also authoritative reference – hence AzhvAr mentions thamizh first. AzhvArs’ words are not like that of vEdhas and ithihAsas and purANas. These words (in thamizh) is that of anushtAthA (who executes the words as per SrIvaishNavam), you see! AzhvArs say about shunning aiSvaryam, kaivalyam and not consider them as required (whereas vEdhas talk about those things also as means/goals). sen thiRaththa thamizh Osai – thiRam -> its feature/capability and ways; thamizh words enlighten in the best way the meanings they carry. Not having need for an upabrahmaNam to explain it more. (There ARE thirumangai AzhvAr’s six prabandhams that are called ‘Aru angam’ for thiruvAimozhi. But thiruvAimozhi does not need them for explaining itself); vEdhas require upabrahmaNam (to explain it well). Agi – His creating SAsthram is about His revealing/spreading it. thingaL nAyirAgi – It is as said in ‘agnau prAsthAhuthis samyag AdhithyamupathishtathE | AdhithyAjjAyathE vrushti: vrushtErannam thatha: prajA: || [manu SAsthram – 3.76]’ (offering that is submitted in the fire for homam (vEdhic ritual) reached the Sun; from Sun, rain is obtained; by rain, food items are grown; using food items, humans live and are created (through father eating the food)); (Agi -> becoming) shows the completion of creation. In previous phrases it showed the meaning of ‘nAra’ (indhran, brahmA, five core elements, etc.). Rest of the phrases of the pAsuram show the meaning of ‘ayanam’. antharaththil – (anupravESam as part of creation) when being inside; when permeating within everything created; by ‘pruthivyA anthara: AnthanESnthara: [bruhadhAranyaka upanishath – mAdhyandhina – 5.7.72]’ (One who is present outside and inside of land/jeevAthmA, One who is not known by the land/AthmA, One who is being inside the land/AthmA and letting it act, such paramAthmA is the AthmA that is never destroyed), so by the word anthara it talks about the permeating quality of emperumAn. But, by ‘dhEvarkkum’, why take up about them specially? even for those who are most knowledgeable, it would not possible to know about Him, that is why AzhvAr is considering them in the phrase. anthaNanai – (emperumAn being a) pure one (in mind; (won’t tolerate others’ suffering; won’t think trouble for others, etc. ); there is a greatness in AzhvArs using this word for implying pure one. nammAzhvAr said ‘aRavanai Azhip padai anthaNanai [thiruvAimozhi – 1.7.1]’ ( most benevolent (due to him bestowing the results); one having the sudharSana chakram (which purifies the heart); the purest eeSvarAn (supreme lord)). (Why not give meaning to that as ‘brAhmaNa’ (in thiruvAimozhi)?) there is no brAhmaNa holding conch and disc, isn’t it? (kAnchi swami said something along the lines of ‘there IS one, and that is AchAryan’; so we could qualify as, One using them as weapons, there is no one other than emperumAn); for kEvalan (one who is after kaivalyam (enjoying one’s own AthmA, and not emperumAn)) emperumAn is shown as the One to meditate upon as the pure one, for getting pure experience of kaivalyam, so nammAzhvAr is divining in that way, in that context. But, here (for thirumangai AzhvAr), is purity required? AzhvAr first talked about creation (indhirar, piraman, etc.,), and then about that emperumAn permeating in all things created (being inside as antharyAmi is required for completing the creation, and for sustenance of the created ones); then he says that the blemishes of those things in which He is present, would not affect Him (He would stay pure (anthaNan)) – this is the point wished to be said by thirumangai AzhvAr here. anthaNar mAttu anthi vaiththa manthiraththai – The matter (emperumAn) mentioned earlier is on the head of vEdhas (vEdhAntham) in mystic ways. Or, ‘manthram’ is said as His divine name in SrI sahasranAmam – manthra: chandhrAmSu: bhAskaradhyuthi: [vishNu sahasranAmam 281, 282, 283]’ (protector of one who thinks about Him; One having comfortable light like moon; One who is too bright like the sun (these are some of His divine names)); by the root of the word manthram, ‘manthAram thrAyatha ithi manthra:’ (since it protects the one who recites it, it is called manthram), so the word manthram is the divine name of emperumAn. anthaNar mAdu – (why say it is the wealth of brahmaNas (and not him)) – saying so to show that he is not of such birth; even though all of it is bright in his mind, saying it out would be a damage to the respect for his eligibility was his state. Even while he is being an at most follower of vEdhas, like saying “others’ wealth”, he is saying in this way in unconnected way in order to establish the respect of the ways. Aren’t there innumerable manthrams. Does the word manthram indicate periya thirumanthram? As said by ‘yAni nAmAni gauNAni [mahAbhAratham – anusA 135.13]’ (names based on His qualities), other manthrams are about his qualities only; for the aforementioned meanings (creator, antharyAmi, etc.) there is no other manthram. So that is why manthram here means periya thirumanthram. Can’t the other manthrams that indicate his permeating everywhere be considered as one said here? No, since the other two manthrams (vAsudhEvan, vishnu), need thirumanthram to complete the full meaning. The manthram which he said with surety as ‘nAn kaNdu koNdEn [periya thirumozhi – 1.1]’ is this periya thirumanthram only isn’t it. Reason for forgetting about experiencing emperumAn would be interest in material matters, so is AzhvAr saying – enjoy without interest in material matters? No, that would not suit AzhvAr; he is enjoying in his final state after sAkShAthkAram (enlightenment / seeing emperumAn (kaNdu koNdEn [periya thirumozhi – 1.1])). So, what then would be for him the reason for forgetting? Since having connection with the body which is having the three types of sorrows (thApams) (AdhyAthimika, Adhi baudhika, Adhi dhaivika), seeing having association with the body, seeing his old history, and seeing the greatness of emperumAn, there is the thought of him having emperumAn as the means for removal of such connection of body without seeing his prior history, and for getting the loved matter that is emperumAn; that thought (of thinking Him as the means) would be the time of/reason for – forgetting to enjoy emperumAn! So try to enjoy Him without getting into the pUrvArdham (first line of dhvayam – which uses Him as means, (that our thought that He is the means, even such thought is not the means; it is His thought that would be the means) (and second line of dhvayam is about enjoying and serving Him); AzhvAr is follower of dhvayam isn’t it? vAzhudhiyEl – prosperity would be yours; I too am your colleague, isn’t it? As vAzhudhiyEl – talking about his mind considering it as a sentient doer, which is his faculty, is due to seeing the predominance of mind. Till the end of life, it is the mind that is the helper for involving towards emperumAn, which is what a mumukshu (one wishing to be liberated from material world) expects from his mind, isn’t it? mada nenjamE – Oh mind who is obedient to me! Without any difference in the time when getting rid of vishaya prAvaNyam (interest in worldly affairs), and in the time of upliftment (experiencing emperumAn), and during the time of enjoyment, I got the mind that is following me obediently – saying so he is celebrating/appreciating his mind. It is like ‘nenjamE nallai nallai [thiruvAimozhi – 1.10.4]’ ((what you have done is) good, good.). This entry was posted in iraNdAm Ayiram, thirunedunthANdakam and tagged thirunedundhandagam on June 23, 2017 by raghuram.